The Death of General Wolfe, Benjamin West, 1770, Wikimedia Commons. 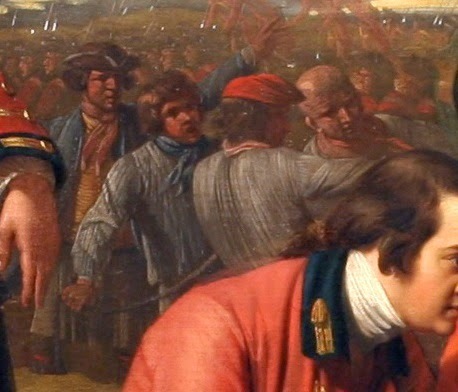 One of the most iconic images of the eighteenth century focuses on the last moments of the famed General Wolfe. 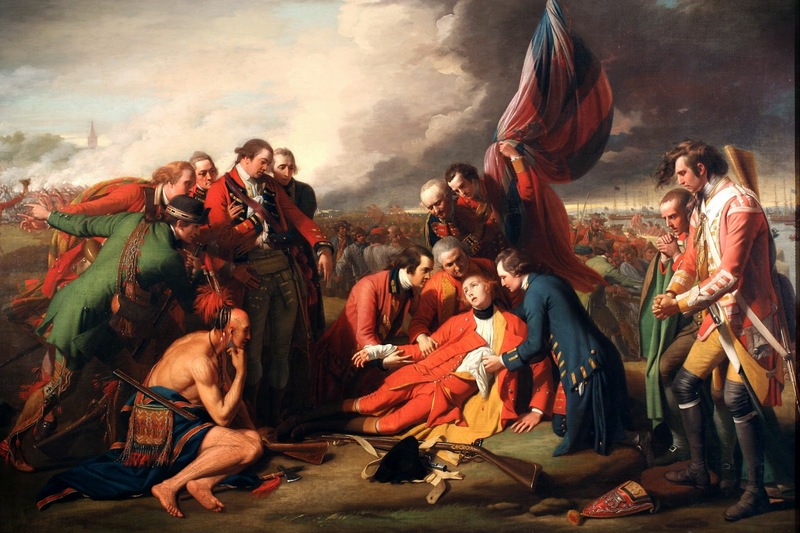 A French bullet spelled the end of his life on the Plains of Abraham outside the walls of Quebec, at the very moment his army claimed victory. This battle ensured that Canada would fall into British hands, from which it would never be relinquished. 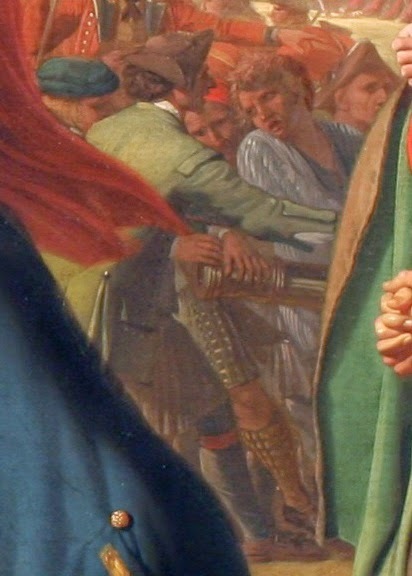 Though the image is well known, it is little known that West's painting contains more than soldiers, rangers, and native allies. Directly behind the officers that crowd around Wolfe is a herd of soldiers and sailors. Under the direction of a sailor (possibly a boatswain or other petty officer), three tars pull at their ropes. The commanding sailor wears a cocked hat with dark tape and what might be a wig with two large curls. Around his neck is an orange-red neckcloth. His jacket is without collar and the standard sailor's blue. It appears he wears cloth covered buttons, but I can't be sure of it. Certainly he wears a single breasted yellow waistcoat with narrow stripes running horizontally across. Our sailor also wears remarkably short slops/petticoat trousers that doesn't even reach to his knees. They appear to be of a darker material, perhaps oznaberg. Interestingly, he wears a pair of breeches of dark cloth beneath with a bright red line at the bottom hem of the legs. The three tugging at the lines are without waistcoats or jackets, and we can't see what they wear at the waist. We can say that two wear plain white shirts with light red neckcloths, almost pink. The other wears a blue neckcloth dotted with white and a checked or striped shirt. The subject of their efforts can be seen further to the right between another pair of officers. Sailors and soldiers all work together to haul a brass barreled piece up the Plains of Abraham. EDIT: Follower Louis Tramelli Jr. pointed out that the fellow in the green jacket is probably not a sailor. I confess, I thought at first glance that the man was a ranger, but the odd garment around his waist was a pair of petticoat trousers. It turns out that the garment is documented to rangers of the French and Indian War. See the next post for a more thorough correction.